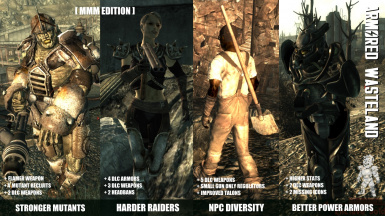 Stronger Mutants, harder Raiders and Better Power Armors are some of the things you now face on the Wasteland. For the Community by the Community, Enjoy! Credit is welcome but not need. Work freely with this mod. - New T-51b Icons FO3 by Captain-Ultima, icons created by him (thanks a lot Captain Ultima). - MMM and UF3P are mods need to be installed, in order for this mods to work. - Marts Mutant Mod, by Martigen, nice work he did improving all the game environment. - Mutant Animation by Talkie Toaster, 2-hands animations were included on this mod to get the tri-beam laser Rifle working (Thanks a lot Talkie). - 4 Super Mutant recluits, will spawn instead of Centaur,a side the other Muntats (Centaur still appear in other cases). - Super Mutant recluits may appear with Nail Boards, Hammers or Axes (DLC). - Super Mutant Captain may appear with a Gatling lasers or Tri-beam Laser Rifles (DLC). - Super Mutant brute now also have flamers. - 4 Raider´s armor type (DLC) added to vanilla Riders. - Bandanas (headbans) added to the Raiders helments type. - Infiltrator (DLC) may appear on High Riders. - Double-barrel Shotgun (DLC) is now a normal weapons between Riders. - Trench Knife (DLC) is now a bakcup weapon. - New Custom Icons: T-5b Power Armors and helments. - Tri-beam Laser Rifle (DLC) may appear on hands of the Brotherhood of Steel or the Enclave. - Infiltrator (DLC) is now part of the Outcast inventory. - Regulators are now full small gun oriented (Energy Weapons removed). - Double-barrel Shotgun, Lever-action Rifle and Infiltrator (all DLC) are available for them. - Sawed-off Shotguns may appear as well. - Infiltrator (DLC) is now part of their weapon selection. - Tri-beam Laser Rifle (DLC) are part of their inventory also. - Double-barrel Shotguns and Lever-action Rifles (both DLC) are available to the Slavers. - Double-barrel Shotguns, Lever-action Rifles, Axes and Shovels (all DLC) will be part of the Wastlelanders inventory. To install just chose one of the .esp files. Then, put the textures/ folder to the /data folder and enable (put it after all MMM esp files). Reload (sleep, wait some hours, go inside a building...) to enable full changes on the saved games. Can conflict with other similar mods out there. - Attached as much as posible to the "Unofficial Fallout 3 Patch". I try to ensure that versions of the mod will be compatible with the patch. - keep as much of as possibleProject Beauty interpolarity (without hard depedencies on it). - Trying to achive as much in-game integration as possible with MMM. Any credits for this mod? - Marts Mutant Mod, by Martigen,nice work he did improving all the game environment. A companion for the mod? Try out Exotic Caravans, to improve the look and fill of the traders. FIX: restore the left hand on any of the Knuckles weapons. Try out the Legendary Weapon Pack, adds 2 new guns to the Wasteland. - Any re-balance suggestions is welcome.